﻿﻿ www.unuudur.com » Moscow Takes Ukraine, Beijing Takes Mongolia? Moscow Takes Ukraine, Beijing Takes Mongolia? Tensions escalated in eastern Ukraine on Thursday, as Ukrainian forces killed up to five pro-Moscow separatist rebels, and Russia launched army drills near the border in response, raising fears its troops would invade. The Ukrainian action took place to recapture territory from the rebels, who have seized swaths of eastern Ukraine since April 6 and proclaimed an independent “People’s Republic of Donetsk,” and marks the first time Kiev’s troops have used lethal force against the rebels. The events are being closely followed by nations around the world, with many leaders denouncing Russia’s actions to change the status quo. International sanctions have been imposed on Russia, and on Thursday, U.S. Secretary of State John Kerry said that unless Moscow takes immediate steps to de-escalate the situation, Washington will impose additional sanctions. Moreover, fears are growing Russia will not be content solely with changing the borders of Ukraine but will look farther afield. NATO’s top military commander argues Moscow may target other Russian-speaking regions, notably another ex-Soviet republic, Moldova, and Transnistria, a breakaway state that declared independence from Moldova in 1990. Though Moscow’s ambassador to the European Union, Vladimir Chizhov, denied Russia has “expansionist views,” should Moscow continue to annex territory, it could set a very bad precedent for how other nations might act in future. One nation that may be watching the events in Ukraine more closely than others is China. China has several active border disputes with its neighbors, including arguments over territorial waters in the East and South China Seas. So far Beijing has acted in a pesky but restrained fashion, establishing an air defense zone that wasn’t taken too seriously, sending military ships into disputed waters in a show of force or as a blockade, and using water hoses to fire on fishing boats from neighboring countries. Beijing’s reaction to the Ukraine crisis so far has been confusing and muted. When the U.N. Security Council called an emergency vote just prior to the referendum in Crimea, Beijing abstained from voting, falling back on its policy of non-interference and choosing not to antagonize its only ally on the Council. Reactions to Beijing’s abstention by the Chinese active on Weibo and WeChat, two of China’s microblogging platforms, was immediate and spirited. In Beijing’s refusal to condemn the referendum, Chinese netizens pointed to the hypocrisy of Beijing’s foreign policy, given its expected divergent reaction should the populations of Taiwan, Tibet or Xinjiang choose to hold a referendum on independence. As expected, the matter is no longer being discussed on Weibo, after all comments linking the Crimean referendum with Xinjiang, Taiwan or Tibetan independence were deleted. Much foreign policy punditry has already focused on the above-mentioned territories and their quest for independence. But now that Putin has opened up Pandora’s Box, what if China decided to annex territory it had long lost? Mongolia is one such large area of territory, ruled by the Manchurians during the Qing Dynasty. Following the collapse of the Qing Dynasty, the Mongols established the Temporary Government of Khalkha in November 1911, and in December, Mongolia declared independence from the Qing Dynasty, ending 220 years of Manchurian rule. Eventually Mongolia came under Soviet influence, becoming a Soviet satellite newly proclaimed as the Mongolian People’s Republic in 1924. When the Soviet Union threatened to further seize parts of Inner Mongolia from China in 1945, China chose to set aside its claims and back a referendum on Outer Mongolia’s independence. The referendum, which took place in October 1945, resulted in 100 percent of the electorate voting for independence. How would Beijing go about the annexation of Mongolia? President Xi Jinping would likely begin by sending welcoming signals to Ulaanbaatar that should Mongolia chose to hold a referendum on rejoining China, he would support the outcome. Prior to the referendum, Chinese troops would amass near the border of Mongolia and Inner Mongolia, awaiting further orders in case the Chinese population needs to be protected. International condemnation would surely follow, although given Beijing’s greater economic power, and Russia’s current status as one of the most hated nations, the penalties would likely be less harsh. Beijing would draw the wrath of Moscow, but Moscow would face territorial battles on two fronts simultaneously. Of course, the above scenario is fanciful, given the ethnic makeup of most Mongolians and their fierce nationalism in opposition to the rule of Beijing. Ethnic Mongols account for about 95 percent of the population and consist of Khalkha and other groups – all speaking some dialect of the Mongol language, and support for a referendum along Putin’s model would fail miserably. Further, the Mongolians have a strong sense of nationhood and have fiercely opposed recent land grabs by Chinese companies. Yet Putin’s strategy of annexation might make more sense in areas where a Chinese-speaking minority find themselves under oppressive foreign rule. 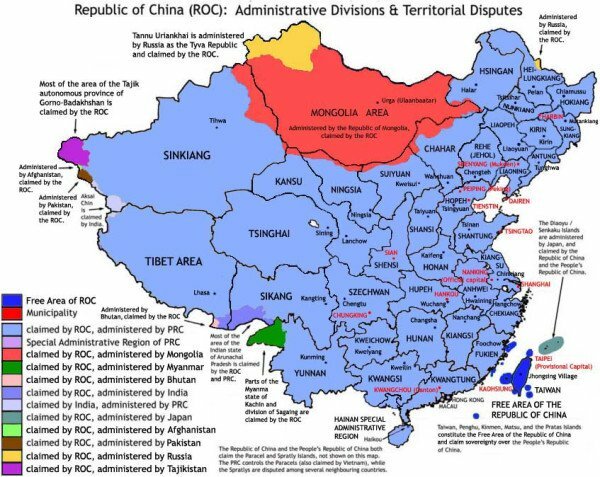 Other than Mongolia, China currently claims territory administered by Russia, India, Japan, Afghanistan, Pakistan, Tajikistan, Myanmar and Bhutan, as well as numerous islands in the East and South China Seas claimed by Japan, the Philippines, Malaysia, Vietnam, Taiwan and Brunei. Given the possibility that Putin’s expansionist policy should expand, U.S. President Barack Obama and European leaders should continue to pressure Moscow to restrain its aggression, and further press Beijing to condemn the Crimea referendum and to give assurance it will stand behind its policy of “peaceful rise.” While Beijing may never condemn the actions of its sole ally on the U.N. Security Council, Beijing will need to give the international community reassurances that what Putin has engineered in the Crimea will not now be regarded as fair play and copied by Beijing in order to assert any one of its disputed territorial claims in the region.